This is a clean out the pantry kind of meal and it’s damn good! At any given moment we have lentils sitting in our cupboard along with jarred tomatoes, coconut milk and spices. Oh, and sweet potatoes–we’ve always got those puppies on hand! This meal comes together in a flash and aside from the time it takes to cook the sweet potatoes it’s a hands off kind of recipe. I love how comforting lentils are and this is the kind of comfort food I’ve been craving. I’m feeling a bit anxious these days (more to come later this week on that) and sitting down to dinners like this help calm me down. 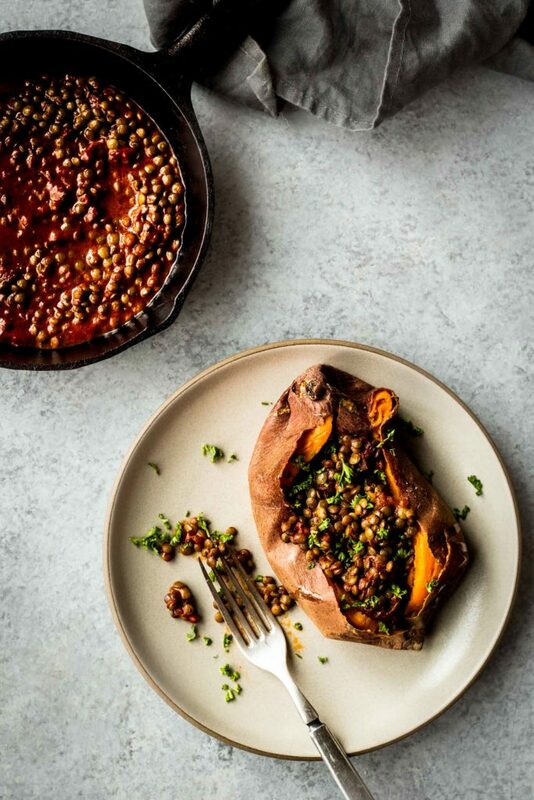 These smoky lentil stuffed sweet potatoes really hit the spot on a chilly night at the farm and when paired with a good dinner date (hi Taylor) and some jazz playing in the background it really is food for the soul. I hope you all enjoy this meal as much as we do. While the potatoes bake prepare the filling. Heat the coconut oil in a deep bottom pot over medium high heat. Add the onion and cook, stirring occasionally until it's fragrant and turing soft. About 8 minutes. Stir in the garlic and cook for 1 minute longer. Add the lentils, smoked paprika and cayenne pepper. Stir until the mixture is well coated in the spices. Add the coconut milk, and water. Bring to a boil. Reduce the heat to medium-low, cover the pan and cook until the lentils are tender, about 30 minutes. Remove the lid and stir in the tomato paste and canned tomatoes. Season with a pinch of salt and pepper. Cook for about 15-20 minutes longer or until the mixture thickens up. Taste for seasonings and adjust as needed. Slice each sweet potato in half and serve with the lentils. Drizzle with fresh lime juice and minced parsley. A great stick-to-your-ribs dinner for a cold night. Can’t wait for your cookbook – on preorder and will be available soon in Canada. I made this last night for meatless Monday and we loved it!! I added spinach to the left over lentils this afternoon for lunch. Super comfort food. Can’t wait for your book! Thank you! I made this for dinner last night. There were just two of us, but I made the entire recipe of the lentils. Now I have dinner for another time and all I have to do is bake the sweet potatoes! This recipe is fabulous! I did add mushrooms because I had some available. Adding spinach seems like a good idea also.